There’s a variety of fantastic beaches dotted around the west coast of Scotland and when the sun comes out to play there’s no better place to head. 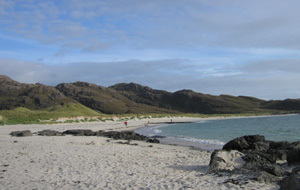 The closest beach to Glencoe is probably the cobble beach at Cuil Bay, some 10 miles from Glencoe village. Convenience and ease of access make this a popular spot when the sun is out. The view down the loch is stunning and its also a reasonable spot to windsurf. Its also a great spot to sit and watch the sun go down round a driftwood camp fire. 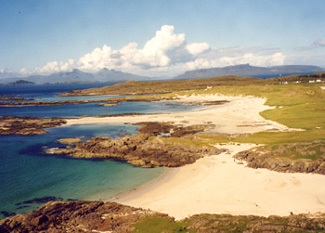 There are several beaches between Arisaig and Morar, with the most spectacular and the most famous being the one at Camusdarach. White sands and azure waters, with a backdrop of the Cuillin on Skye make this a truly special place. The beach is probably most famous for being the spot where Fulton Mackay lived in his upturned boat in the 1980’s film Local Hero. 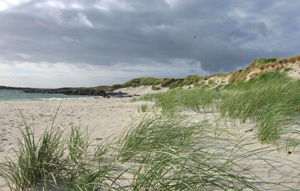 The main beach at Camusdarach is hidden from the road by a band of sand dunes. Walk between the small rocky outcrops and you’ll find more smaller stretches of sand, and you’ll probably be unlucky if you have to share them with anyone else. For the picture postcard view, there’s also the sands where the River Morar (Britain’s shortest river!) joins the sea. You can tell the difference between salt water and fresh by the temperature! 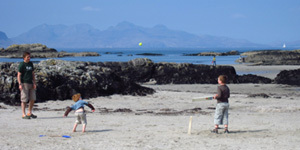 After a great day out on the beach, pop along the road into Mallaig for a fish supper. Hidden away in the small community of Glenuig, between Acharacle and Lochailort, you’ll find a delightful sandy beach along the road which runs past the Glenuig Inn. Well worth a trip in itself, but more usually a stop off point on a round trip of the peninsula which could take in Tioram Castle, a walk out to the partially ruined crofting community at Smirisary and perhaps, some well appreciated refreshment at the inn! For the more adventurous there’s a hidden gem looking along the north shore of the Ardnamurchan Peninsula. The very fact that you have to either walk or bike to it means that there’s never more than a couple of people there. From the village of Acharacle head west towards Kentra but then turn left onto an even smaller road. Follow this to the very end where there’s a small car park, beyond which you’ll see the rough landrover track heading off along the shore. From here, it will take about 45mins to walk, or an easy bike ride if you’ve brought the mountain bikes. The sandy beach looks right down the north shore of the peninsula and has magnificent views of the Small Isles of Eigg and Rum beyond. The landrover track does in fact continue on to Ockle point and there is also the possibility of biking/walking through to Ockle on an ancient track. Perhaps the best of all, the most westerly beach on the British mainland has that remote, almost desert island feel to it. Its a long drive out to Ardnamurchan Point, in time if not in miles. On a good day, it is simply a stunning trip. Whatever the weather, however, a journey out to this remote corner of the UK is always a highlight. Combine your trip with a visit to the Ardnamurchan Lighthouse where there’s a cafe and exhibition (make sure they’re open before hand if relying on it!) Its also well worth calling into the Ardnamurchan Natural History Centre in Glenborrodale. A trip south towards Oban is usually a very popular day out. Whilst there’s castles and distilleries to visit, there’s also the opportunity of hitting the beach as well. Try the big sandy beach at Tralee (close to Benderloch) or the more popular Ganavan Sands just round the corner from Oban town centre. Whilst these beaches are probably the most popular, in the area, search carefully and you might find a few others. For example, there’s easy access to a beach in Onich, just by the Onich Hotel, a nice east facing pebble beach at Inversanda (by the road to Strontian) and a deserted stretch of sand near Peanmenach Bothy on the Ardnish Peninsula, a simply stunning place to sit and watch the sun set over the Sgurr of Eigg.